Sciblogs | Which scientists have got it right about introduced wildlife in New Zealand? Which scientists have got it right about introduced wildlife in New Zealand? Scientists tend to shape our beliefs about wildlife in New Zealand, and particularly how we think of introduced species. But what are we to think when scientists disagree? Conservation biologists, for example, tell us that introduced wildlife are invasive environmental and economic pests while fisheries and waterfowl biologists tell us that they are valued additions to our environment and economy. The question one of us asked in a recent article in the New Zealand Science Review is: Which view is correct? That article took a look back at the history of scientific research on introduced species in this country and found some surprises. First, scientists’ views on wild exotic plants and animals in New Zealand have changed quite a bit, so can we be confident that the current views will be any more durable? When early European settlers were importing new bird, mammal and fish species in the mid-19th century, most scientists were pretty keen on it. They were happy to see the familiar species from home added to the rather drab New Zealand wilderness Darwin had described as gloomy and silent when The Beagle visited in the 1830s. When, in the late 1800s, Acclimatisation Societies were set up to run the introduction business, local scientists were among their foremost members. At the time, these scientists thought it inevitable that the weaker native species would be replaced by more robust European ones. Conservation of natives, where it was considered, was largely restricted to preserving dead specimens for posterity – hence much effort was devoted to shooting them, stuffing them, classifying them, and propping them up in museums. Native conservation efforts of the mid-19th century. 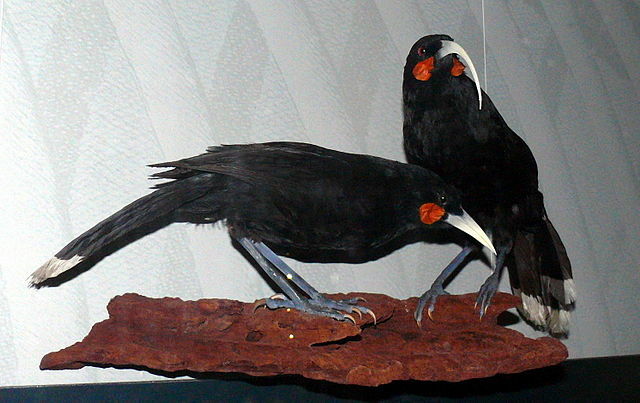 A taxidermied pair of native huia (now extinct). To be fair, most scientists at the time were more in the vein of gentlemen poets – typically hobbyists and generalists rather than lab-coated specialists. They were not conservationists in the modern sense of the world. The wilderness they sought was a vigorous hybrid of the native and the new in which the introduced species would add colour, variety, and recreational and economic opportunities – making the now vilified Australian brush-tailed possum, for example, seem like the perfect addition. In the latter part of the 19th century, however, scientists’ attitudes started to shift more toward those we would recognise today. This change seems to have been driven more by cultural values and fashions than by scientific research. As the first wave of overseas-born settlers gave way to New Zealand-born second and third generations, nostalgia for Europe was replaced by a new found pride in their southern home. Native species started to be celebrated and introduced ones denounced, especially if they appeared to compete with or prey upon native species. This new attitude applied mainly to native birds and the species that threatened them, but introduced fish maintained their privileged status. Acclimatisation Societies, for example, waged regular pogroms against several native species that competed with trout, notably shags and eels. The goal was to preserve the New Zealand native landscape, but to stock it with exotic fauna for rich tourists to hunt. From around the 1930s, wildlife management as a scientific discipline began to develop in New Zealand and, with it, more rigorous scientific methodologies. Most of this research was initially directed toward showing how to produce ever-greater numbers of introduced fish and game animals. But as people became increasingly convinced of the superiority of natives, more and more conservation science was directed toward demonstrating this as well. This direction became further entrenched after the development of restoration ecology in the 1980s with its crushingly nostalgic focus on a pure and pristine New Zealand wilderness. Today, there’s a lot of advocacy science going into showing the positive aspects of our native birds and plants and the negative aspects of introduced species – except for fish, game and farmed species. Much of this research is now used to justify the spending of millions of taxpayer dollars on pest control, even while one of the main pests, the possum, does not always live up to its wicked reputation. A deep belief in conservation circles, for instance, is that possum herbivory is a prime cause of native tree canopy loss. However, the only long-term study designed to confirm this found just the opposite – no difference at all over a decade between possum-infested and possum-controlled plots and no adverse possum impacts on tree health, size or abundance. Studies like this are rare, however. We don’t get much research investigating the potential benefits of wild introduced species, nor for that matter, the impacts of game species on natives. There’s a lot of research showing how desirable past ecosystems were but very little looking at how we might move on to desirable novel ecosystems in the future. The reason for that is pretty straightforward: such research does not tell conservation, pest control and fish and game advocates what they currently want to believe, so no one will fund their investigation. Which scientists are we to believe? To return to the question posed by this article, which scientists are we to believe? We think the answer is that all are telling a subset of the truth about introduced wildlife, but it is not a balanced or objective subset. Because scientists, like everyone, are guided by their values and worldview (and even more so by those of their funders and employers) they tend to focus on questions that do not challenge their own underlying beliefs. As a result, the small subset of the truth that they tell us is conditioned by a kind of ecological xenophobia – the idea that, in our wild places (though not our farms and towns) natives are good and exotics are, by definition, bad. This idea forms their null hypothesis, which is assumed to be true unless strong contrary evidence is found. It stands to reason that if no one is looking for contrary evidence, it is a null hypothesis that will never be rejected. To get a more balanced picture and make a more accurate assessment of the role of wild introduced species, scientists need to be more open about their values and acknowledge how those values influence the questions they choose to ask, and where they work and the questions they will be allowed to ask. And, of course, scientists need more support from the many other fields – most notably in the arts – where values are dealt with more openly and not submerged beneath a veneer of objectivity. How we choose to see introduced species is a matter for the whole of society to debate and explore. Let’s not rely on the current enthusiasms of some of our biologists. 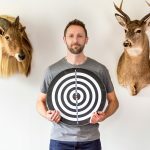 Dr Jamie Steer has worked in a range of different roles in the environmental services industry, including as an ecologist for an environmental design consultancy. He is particularly interested in challenging current attitudes toward introduced wildlife. Rowan Taylor has had a long-standing interest in global environmental issues from co-founding Project Jonah and instigating the Marine Mammals Protection Act in the 1970s to producing New Zealand’s first State of the Environment report and representing NZ at the OECD’s Group on Environmental Performance in the 1990s. His current interests focus on the environmental costs of livestock production and the impacts of dietary choice on climate change and water degradation. 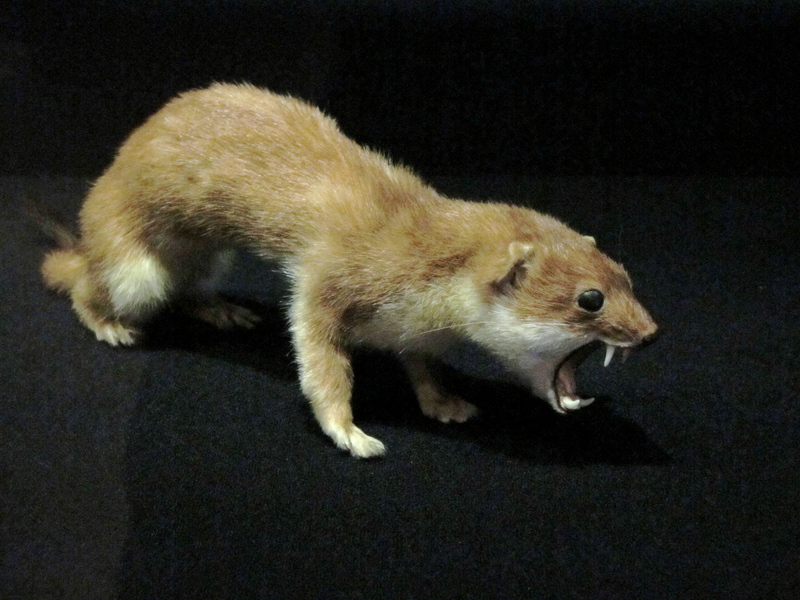 Featured image: A taxidermied stoat, Museum of New Zealand, Wellington. “possum herbivory is a prime cause of native tree canopy loss.” “the only long-term study designed to confirm this found just the opposite”. The experience of the impact of possums on Rangitoto was dramatic loss of Pohutukawa canopy that was clearly visible from Auckland city. Furthermore, it isn’t a formal scientific study but I have observed on Johnson’s Hill, Karori, Wellington that since possums have been controlled by Brodifacoum, over several years there has been a sequential increase in insects due to increased leaf litter which in turn supports more bird life such as fantails and introduced species such as blackbirds, considerably increased numbers of Puriri moths presumably due to reduced possum predation on the larvae, and this year in particular, a massive increase in flowering of Kohekohe trees, which is providing winter feed for many tuis and kereru. I suggest a broader ecological view of the impact of an introduced species needs to be taken, instead of just looking at impacts on a narrow range of species. It is great to see an article discussing this issue, but it’s a pity that it is not as well researched as it should have been. There is a pretty clear consensus among fisheries biologists in NZ regarding the negative impacts of exotic fish species, particularly trout, on our native fish and aquatic ecosystems generally. There are a wide range of published studies describing these effects. Furthermore, there are increasing efforts to exclude exotic fish in a bid to protect some of our most threatened native fish species. There was also a recent project to eradicate trout from the waterways of Zealandia in Wellington. Increasingly attention is also being turned to control methods for cyprinid species, such as koi carp and perch, which are more of a problem in the North Island. Unfortunately, salmonids actually have greater protection under NZ law than native fish. They also have greater economic value than any of our native species due to the world renowned fisheries they support. The reality is that there are few fisheries biologists that believe there is a positive environmental benefit associated with these exotic species, and generally quite the opposite, but due to their economic value and widespread distribution they are in most cases, unfortunately, here to stay. Great article that offers a needed challenge to status quo thinking. We introduced native species to NZ, then decided we made a mistake, so we’re dumping poisons into the environment to fix the “mistake” and calling for wholesale slaughter of unfairly demonized species (i.e. possums). Sounds like humans are the most invasive species of all, and it is sad we haven’t learned the damaging costs of our endless need to fiddle with nature. Could you supply the citation for this long term study on possum browsing? I don’t think I’m familiar with it. Thanks. Hi Brendan, follow the link to the NZ Science Review article at the start of this blog. Cheers. There are various frustrating issues involved here. Economic factors taint the science to some extent, as per usual. Few, if any, scientific questions can be answered conclusively. Handling inconclusivity is difficult on a pragmatic level. The issue here probably isn’t entirely a scientific issue. It may also be a matter of values, taste and personal opinion whether it is worth trying to eradicate introduced mammals. We are an introduced mammal after all! Should we all leave the country? You can’t turn back the clock. I expect that economic factors will determine the outcome. The view of the group who collectively hold the most power and have the most to gain financially will be adopted in the end. Your summary of Bellingham’s 1999 study is completely misleading. I suggest you re-read it with an open mind. There is nothing in Bellingham’s study to support your contention that: “However, the only long-term study designed to confirm this found just the opposite – no difference at all over a decade between possum-infested and possum-controlled plots and no adverse possum impacts on tree health, size or abundance”. In other words, the high infestation of possums had completely destroyed the biodiversity already so there was no chance of there being a worthwhile and meaningful scientific ‘control’. Thanks for reminding me about this blog article ‘Sunny’. I’ve been a bit remiss in responding to comments on this one. First, I can see diplomacy is not your strong suit. Not sure what you imply with your ‘open mind’ comment. You seem to insinuate that I am deliberately trying to mislead. At the least, can you be more explicit with your personal attacks…? Second, you’re right, this very short blog article does not speak to all the nuances of this particular reference (though to be honest I’m not sure I agree that the ‘key text’ in Bellingham is their reference to another article). I do a little more of that in the paper of mine to which this article refers. Ultimately blog articles are not intended to be comprehensive. The purpose of this article is to open up conversations about the extent to which we may choose to investigate topics that confirm our pre-existing beliefs (or that don’t upset longstanding compromises) around which species matter in NZ. Maybe you’d like to comment on that instead?